The DNS-320L ShareCenter™ 2-Bay Cloud Network Storage Enclosure is a Network Attached Storage (NAS) device with mydlink™ Cloud Services, backup and media features that make it ideal for storing and sharing photos, music, movies and work files on a home or business network. 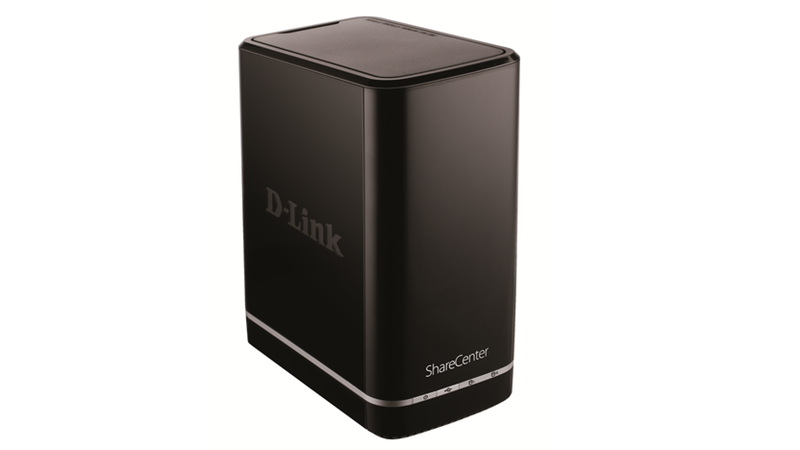 Access your files anytime, anywhere with your ShareCenter™ Cloud NAS and the mydlink™ Access-NAS app. View your photos, access your documents, listen to music, and watch movies on your iOS or Android device over 3G or Wi-Fi. A Complete Home Storage Solution The ShareCenter™ 2-Bay Cloud Network Storage Enclosure is the perfect home solution to share, stream, manage and back up all of your digital files by creating your own personal Cloud. Remotely connecting to your ShareCenter™ cannot be easier, simply download the free mydlink™ Access-NAS mobile app. The NAS mobile app, allows you to access your files and stream music, video and photo content to your smartphone or tablet from anywhere around the world. Plus, the simple and intuitive hardware design lets you easily add up to two 3.5” SATA hard drives to your device without the use of any tools, making the ShareCenter™ a powerful, scalable solution for your home or office. The DNS-320L includes smart library applications that allows you to organise your music and photos effortlessly. Experience the full benefits of managing your files with the built-in applications such as My Music, My Files, My Photos and P2P downloads. You can manage your P2P downloads, view your photos, stream music, access your files, either within your home network or remotely via mydlink™, whereas My Surveillance allows you to record and manage videos from mydlink™ cloud cameras. Configure your ShareCenter™ for ultimate remote access and management in the palm of your hand – simply log into your personal account via mydlink.com or mydlink™ Access-NAS mobile app on your iPhone, iPad or Android device and access or share digital content to your computer, tablet, and smartphone from anywhere. Experience the full benefits of managing your files using mydlink Remote Manager. Conveniently access your NAS applications - My Music, My Files, My Photos, P2P downloads via mydlink™ from anywhere. You can manage your P2P downloads, view your photos, stream music, and enjoy the versatile remote accessibility ShareCenter™ delivers. This enclosure supports 2 x internal SATA HDDs up to 4TB capacity (please refer hard disk compatibility list in the download section for more information) to the and installing them is as simple as popping the top and sliding them in. Push the latch button to access the drive bays, then just slide your drives into place and you’re ready. 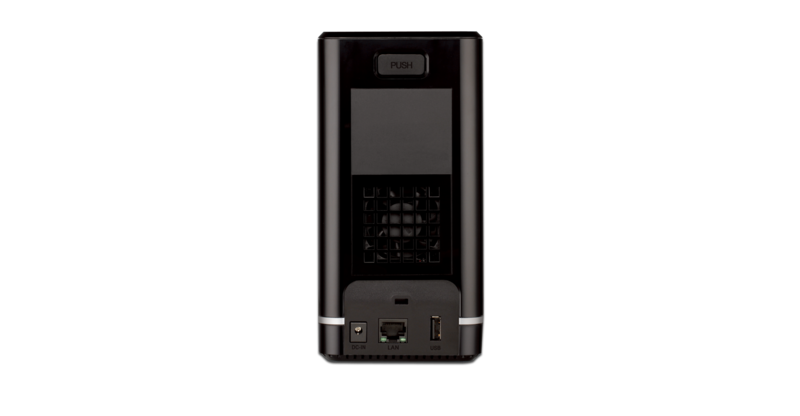 A convenient USB port on the back of the ShareCenter™ can be used to either share a USB printer with an entire home or office, or attach an external USB storage drive for easy one-touch backup. You can also connect an Uninterruptible Power Supply (UPS) to monitor power levels and ensure the safety of your data in the event of a power failure. Plus, you can copy the contents of a USB dongle at the touch of a button. Back up your digital media files to the ShareCenter™ for safekeeping, and enjoy the benefits of the built-in DLNA Certified UPnP AV media server. Stream digital content to compatible media players such as the PlayStation 3, Microsoft Xbox 360, or directly to a smart TV. You can also enjoy photo, music, and video streaming remotely through mobile devices. Four different hard drive configuration modes are available (Standard, JBOD, RAID 0, RAID 1). RAID 0 combines both drives in a “striped” configuration, which provides maximum performance when using a Gigabit Ethernet connection. RAID 1 creates a copy of your data on both drives, providing maximum protection; if one drive fails, the unaffected drive continues to function as a single drive until the failed drive is replaced. The DNS-320L is hot-swap enabled meaning you can easily replace a failed drive and your data will automatically be copied to the new drive. Fyra av D‑Links senaste produkter, DNS‑320L nätverkslagring, DCS‑6010L Fisheye‑kamera, DHP‑W310AV trådlös powerline‑adapter och DWR‑910 Petit router har fått produktdesignpriset red dot 2012. Designpriset red dot är den största och mest berömda internationella hyllningen av industriell design. Varje år utvärderar prominenta designers och experter från hela världen produkter baserat på kriterier som nivå av innovation, funktionalitet och kvalitet. I år tävlade fler än 4500 produkter om den eftertraktade utmärkelsen.